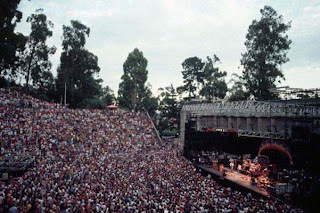 The Dead and the Greek Theatre. These two got along very well for many years. There are countless classic Dead shows from this venue (29 total dates at this spot, spanning the entire 80’s plus one show each in ’67 and ’68). One look, and you can tell it has more than just charm. An outdoor stage, done in the traditional Greek bowl style. Tree-lined, and cradled in Berkeley, California. I pondered many a show to be the first to recommend from 1984. There are so many excellent choices. But my mind kept coming back to 7/13/84. Not just because it features the Dark Star encore (the only time this song was played between 12/31/81 and 10/9/89), but because the entire recording is filled with treats, and a good recording from the Greek in ’84 is a critical sonic experience in any Deadhead’s book. This show/tape has it all. The first set is playful. The band isn’t forcing anything, and they seem in good spirits. Jerry is engaged and playing well. There’s nothing earth shattering going on, but none-the-less, the set gives off a wonderful “Dead vibe” throughout. It’s a really nice slice of how warm and inviting a first set from the mid 80’s could be. The sound sparkles and shimmers just enough to let you know that there’s more at play here brewing its way into the second set. Set two sets off with a Scarlet Begonias > Touch Of Grey > Fire On The Mountain. Touch wouldn’t make it to the Billboard Top 10 (number 9) until 1987, but the song had been in the Dead’s rotation since 1982. Jerry’s discovery of the tune deep in the Scarlet jam is very nice. The crowd loves it. The outro into Fire is well done, and later, when the crowd beings to clap along, you can’t help but be completely swept up into the moment. Band and crowd, once again, locked in a lover’s embrace. Space is something that could occasionally meander from time to time in the 80’s. Jerry could sometimes find himself endlessly swirling in a brooding, minor key vortex. This is not the case on 7/13. This Space is really nice, and transforms the entire venue into spinning planets and stars. Everyone is playing at it with attention to detail. A beautiful Wheel comes out of Space, and later, Jerry’s delivery of Stella Blue hushes the entire crowd. His exit solo gently builds upon itself, winding its way slowly into the evening air, building energy all the way. Sugar Magnolia rocks down the house, blazing the set to a close. It’s hard not to heap a lot of hype onto this Dark Star since there isn’t another one for nearly four years in one direction and over five years in the other. It makes judging it conclusively nearly impossible. But if you strip away the inclination to hold it up against Dark Stars of the 70’s, what you’ll find is about 16 minutes of sweetly performed 1984-style psychedelic interplay that blurs the tree tops into the starlight. There are nice moments where Jerry hones in on some wonderful riffs and rides them into the night air. Late in the jam, when the song’s theme reappears and you think the last verse is about to begin, they drift away from it, gently floating into deeper pools of refracting light. The crowd seems to have collectively closed its eyes, breathing slowly and deeply. At the end, they let the music unravel like a wave slowly slipping along the sand back into the sea. They seem to be delicately placing a jewel back on its shelf in a glass cabinet, being ever so careful not to disturb even the air around it. With a hush, it’s over. This has long been one of my favorite shows. As much as I love reading your posts and hate to nitpick, isn't that Phil who asks for patience before the Dark Star? I kinda knew this was going to come up. I listened and debated over and over. I think it totally sounds like Jerry until the end when he says "one night only," which sounds more like Phil. In the end, I personally feel that the first lines don't sound anything like Phil, and do sound like Jerry. I'll try to track down an attendee or two and get confirmation. I saw shows at the Berkeley Greek in 82 and 85+, but missed this most famous one. The bestest venue ever, IMO. You can pick 'em, but you can also write about 'em. Thanks (again), and please to carry on. No worries, tardisrider. Your comments are most welcome. Please never hesitate to chime in. John Dwork has a pretty good story on his attendance of this show in Volume II of Deadheads Taping Compendium. He says that Phil had a friend at Nasa with some new shots of space and was pretty pumped about it. So he arranged for them to play Dark Star while they flashed slides of the nasa pics. When I was a fledgling deadhead I got this show from a music store on CD. It sounded horrible (I didn't know then, but it was a really poor mp3) and it was the second set only minus the encore of Dark Star. I fell in love with this set, and was even happier when I laid my ears on the Dark Star. Not the best, but pretty fun if you like 80's Dead, and I do. Thanks for the blog, its good fun. I was there and we were all wondering what the NASA slideshow was about. My friend said they were shots of Mars showing proof of some ancient life. Whatever. I also remember seeing Bill Walton backstage/sidestage. Tall guy on stage really stood out. I remember the feeling I had at some '84 shows... the aural equivalent of watching a watercolorist paint with a sure-handed and delicate touch. The brush gently touches the paper, the paints flow in chaotic yet expertly guided patterns, mixing, layering, blending, leaving some spaces empty or tinted with the lightest of washes. The Dark Star was planned ahead of time due to the fact that it was the first full moon on a Friday the 13th in 200 years. While I was outside waiting for the gate to open this guy next to me was saying "Phil has seen the setlist and is very excited." I was thinking yeah right, until he pulled his all access pass out and went back in the venue while the gates were still not open. The other tip off that something was going on was the nod to Monty Python on the entry sign. In addition to the normal not allowed items "No exploding penguins" were to be allowed at this show. Finally once inside you could see the slide show screen hanging and a hole in the curtain where the projector was. In these days there was no projection and screens behind the band except on special occasions. It was a great show and the 7/15 show on Sunday was too. You know, back in the day this was one of my favorites. Being a child of the 70s & 80s the Greek typified the kind of GD experience I longed for living in Chicago. However, after an early 70s immersion for the last few years, I listened to this show and boy was I disappointed. Jerry sounds lethargic, and nearly comatose (soon to come I believe.) The words seems rote and the emotion forced. Perhaps the rest of the boys were into the show (i.e. Phil) but damn if it sounds like Garcia is ready to die. I've listened to a few of these early 80s shows and they all seem to exhibit the 'sick Jerry' sound. I want to get back into them because of the memories, but damn. Am I crazy? 7-15 is THE overall show from this run for my 2 cents. yes, the dark star encore is legendary, but the energy of the sunday afternoon jam is incendiary. the playin' jam is on fire, and the space->china doll->throwin' stones->not fade is SMOKIN'. 2 more cents regarding 1984? 10-12. the oade recordings are pretty good, but, dang, if they didn't rip a hole in the augusta civic center that night. All of the 84 greek shows rock, check out the shows that were played later in the year 10/27/84 through 11/3/84, the later shows have some unique setlists. Don't know if this was mentioned already or not, but the Dark Star was pre-planned. There were screens set up on both sides of the stage and they showed a slide show of lunar landscapes, etc. during the Dark Star. Also, if you listen closely at the end of Dark Star, Phil suggests Morning Dew by playing the opening bass lines. I was there that night and when Phil did this, Jerry shook his head "no." 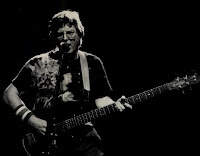 Now wouldn't a Dark Star->Morning Dew have been a mind blowing encore! As it stands, we were all overwhelmed with joy to be present for such a special moment in Grateful Dead history. Had to be there. Dark Star was a treat but that Stella Blue had the place pin-drop, shiver-inducing quiet.